More sea turtles and nests have been found in the area—stressing the regional importance for this group of very charismatic creatures. Ever since the legacy of “Peñasquita”—the first hawksbill turtle adorned with a satellite transmitter to track information concerning her migratory route and nesting grounds, released into the Eastern Pacific on October 24, 2008—more turtles and nests have been found in Puerto Peñasco. Paloma Valdivia, education coordinator of the Intercultural Center of Desert and Oceans (CEDO), reported via press release that staff from Playa Encanto came across a young olive ridley turtle with a shell measuring just 30 centimeters in length. Unfortunately, this turtle was quite sick and later died. Shortly thereafter a tourist came across a young black sea turtle near Playa de Oro. 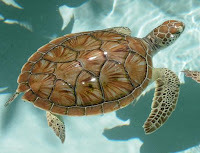 Furthermore, she added, just recently a hawksbill turtle was found at Playa Miramar, which was also just a young sample! This turtle is currently recuperating from a slight illness at the CETMAR Aquarium and will be released around the same place where it was found. The CEDO official added that, generally, the Northern Gulf of California is feeding grounds for sea turtles, although it is known that some species occasionally nest in Puerto Peñasco. “In fact, although no nest had been fully completed given the extreme climate conditions of the region, during the last three years there have been reports of nesting along different beaches,” she explained. Nevertheless, this year the sea turtle nests have been in luck! Two nests of the olive ridley turtle (Lepidochelys olivacea), and one of the black sea turtle (Chelonia mydas agassizii), reported at Playa Encanto and Playa Miramar, respectively, hatched young ones successfully. Coincidentally, the young turtles were born on precisely the same day of Peñasquita's release. Valdivia indicated that up to now, the importance of the Northern Gulf of California for young sea turtles had not received much reporting, which is a very important point within conservation efforts of organizations on a global level. She said that while in Puerto Peñasco, it is necessary to take care of the beaches where nests have been detected; it is much more important to protect the feeding grounds at sea, as turtles spend many years there and their reproductive success does not only depend on the environmental health of the site where they are born but rather the sites where they grow. “We all can contribute to saving the sea turtles. If you want to help, pick up trash found on the beach, report any fishing or eating of sea turtles to the proper authorities (PROFEPA in Mexico), and let CEDO know if you find a nest or a sea turtle on the beach. Only we can prevent their extinction,” stressed the press release.